A Very Little Bit of M/V LOTUS History & a Video! At 92 feet, Lotus was the largest power yacht on the West Coast in 1909. She was launched in Seattle during the Alaska Yukon Pacific Exposition. Her owners fitted her out with Tiffany lighting, Rookwood tile, leaded glass windows and more than the usual comforts of home. Lotus retains the charm and original furnishings of that lovely, adventurous era. Lotus has been a familiar sight in Puget Sound and on her way north to Glacier Bay, Alaska for nearly 100 years. Step aboard and step back in time. 100th Anniversary – Hiram Chittenden Locks LOTUS 1909 will be boat # 5 in the Parade of nearly 60 Classic Vessels from the Locks to South Lake Union,Seattle. 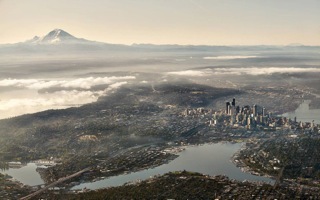 Watch us from the Canal East to, and around Lake Union. The wonderful Costuming in Seattle group will be aboard. So Wave!! Well-maintained vessel by former owners over the past 95 years. When the Foundation was set up to support the return of Lotus in September 2004, she required clearing, cleaning and pickling of decks, hold, and hull. Wash down interior and prep and paint some rooms. Begin regular maintenance program of all electrical, fuel and water and safety systems. Shipwrights recently rebuilt watertight exterior door. Paint interior rooms. Prepare exterior for paint and repair work. Purchased original diesel cook stove. Regular maintenance, replace, or repair as necessary or as recommended by NAMS surveyor, or upgrade and comply with standards of NMTHV and US Coast Guard. A haul-out was completed in February 2012 during which the hull was corked and painted, and much of the top-sides was re-painted. Foredeck repairs are indicated – replace forward bulwarks and foredeck, and ,repair frame ends as per current survey by NAMS surveyor. Upgrade hot water radiator heating system. Repair and replace as necessary exterior siding port side. Reinstall original diesel cook stove. Reinstall speaking tube from pilothouse to engine room. Repair original onboard telephone system. All work as directed by NAMS surveyor in accordance with NAMS, standards and National Maritime Trust for Historic Preservation and the US Coast Guard. Collaborate with the alumni of the NWSWB and local High school shop classes and our own Friends of Lotus Volunteer program for the varying degrees of talent needed for restoration projects. Vessel has been well maintained. Clean, paint, varnish, oil, pickle all decks, holds, hull and exterior keep; and keep the interior dry, painted and in good repairs. Inspect, clean, oil, repair and upgrade and maintain, as needed all electrical, fuel and water systems. Professional refit of propane fireplace insert in salon and diesel heater in pilothouse. Continue regular maintenance of the vessel through standards established and set forth by the NAMS, Shipwrights, NMTFHP and the US Coast Guard. Develop a home base / moorage in the Puget Sound Waters to keep Lotus accessible to the general public and keep Lotus protected and accessible to Marine trades for maintenance. We are committed to seeing Lotus through the next 100 years. Vessel well-maintained by former owners over the past 95 years. A new website has been designed to help showcase Lotus to a larger audience online, world-wide, and to help raise additional funds to support the Foundation. Preserve the photos, logs, ledgers, books, personal effects and original household furnishings of original owners, crew and guests. Development of permanent on-board displays of the Deco, Art Nouveau and American Arts and Crafts movement through the historic artifacts belonging to the MV Lotus. Duplication of all written work, photographs and drawings, originals stored to ensure archival quality. Collaboration and guidance with Seattle Historical Museum. Continued collaboration with Jefferson County Historic Foundation through the MV Lotus annual Gold Rush dinner aboard Lotus. Continue to collect and support volunteers (Friends of the Lotus) to undertake the full range of boat keeping and crewing. Continue to raise awareness of the historic value of Lotus through participation in living history events and by open boat at the dock. Development of the Lotus Days Living History program and the opportunities to become a docent onboard. Re-establish the radio programs that were held in the past by the Evergreen University aboard the Lotus – celebrating the lives and the events of ships of our National Maritime Heritage. 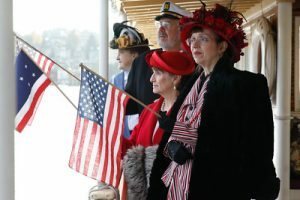 Plans to participate in as many local and regional events, parades, opening day wooden boat and classic boat activities and festivities as the Board of Directors can accommodate. Continued collaboration with Local and Regional Museums of the North West Coast of the US and Canada. Development of displays (permanent and traveling) of the life and times of the Lotus – who she met, what they were doing in their life and the impact of Lotus, crew and guests, as well as other cruising white men on the life of the NW Coast Native population and early white man settlers. We would like to explore those affects with the regional tribes – canoes vs. longboats, skiffs, and the beginnings of fishing fleets overlapping into the natives long establish way of life. What did we learn – what did they learn. Journals detailing cruising voyages off the crew and guests of the Lotus are rich in these stories. A book will help tell her story and raise funds for the foundation. The Lotus has a long history of involvement in the local community of wooden boat and classic yacht enthusiasts & builders, boat festivals, The Evergreen University history and communications programs, Seattle Opening Day activities, The Manette Pioneering Group, Olympia Farmers Market Group and many more locally and regionally have experience Lotus at the dock or on the water, through her many trips up and down the NW coast television and newspapers have covered many of these events and city fathers of many NW Coastal towns have greeted her at their city dock for a tour and to reciprocate by showing off their community to the crew of the Lotus. September 2004 was when the Foundation took responsibility for Lotus. We immediately made Lotus available to the public. We hosted tours for members of NAMS; Center for Wood Boats, Jefferson County Historic Society, the Wood Boat Foundation, and Northwest Maritime Foundation the Ships Modelers, the Sound Experience, The Port of Port Townsend Port Townsend Visitors Center as well as many local action clubs. The Leader Newspaper wrote a front-page article with many photos announcing our arrival and mission for Lotus and that we were again open to the public and developing volunteer programs. We bought an ad in want ads and were listed in the ongoing public activities notice. We built and set out painted signboards on the road and banners for the masts and shipboard display to encourage participation. We established, by newsletter, the oral tradition and tours that we would make the Lotus available as an ambassador vessel for any public or private event the Lotus board of directors deemed appropriate. The MVLF printed an information sheet of the historic value of Lotus and statistics of the vessel, as well as produced post cards for sale with photos of Lotus from 1909. Lotus participated in the fund raising program for the Jefferson City Historical Society as the site of the first annual Gold Rush Dinner for 12 aboard the Lotus. The foundation is developing a presentation to the Washington public schools. We are developing a collaboration plan with Puget Sound Maritime Historic Society, the Canadian Real Estate Board who presents the Classic Boat Festival in Victoria every summer – and where Lotus was a past participant every year 1980 – 1996. Outreach letters are being written to the museums of many coast towns and villages of the NW Coast to Glacier Bay to request information about a visit from the Lotus at any time in the past 95 years. We know there were dozens of trips. We have had an opening conversation with the local tribe representatives to hopefully begin a dialog with the elders regarding the impact of the vacation cruising “White men” on their lives, from the early 1900’s to the present. Also their were several folks who worked as crew on Lotus over the years – immigrants relocating and working the waterfront- as one set of voices -their notes and remarkably have family members that come by for visits and have their elders story to tell. Border is a white man’s word – an in imaginary line in the water that never existed in the language before the white man. We would like to continue the literacy, science, and exploration of the natural and cultural history of this NW Coast. We hope to develop a living history program that is valued by the Northwest Maritime Center on Port Townsend Bay. Lotus should be a bio-diesel fueled craft. We will make a first effort to begin mixing bio-diesel into her fuel tanks as soon as funding allows. Applied for grant from Jefferson County Historical Society and Received Recognition. Exploration of grants and other programs available to 501C3 organizations for the preservation and education of vessels of Lotus age and caliber.